Former Manchester United boss David Moyes says there was no complacency in the Scotland team that lost 1-0 to Georgia on Friday. 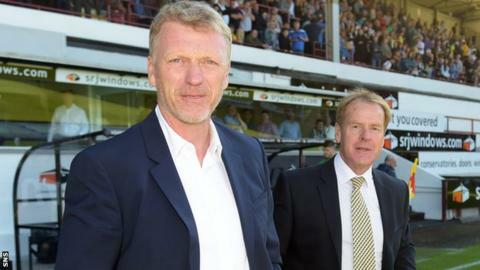 Instead he says they were beaten by a better team in the Euro 2016 qualifier that leaves Scotland fourth in Group D.
"I don't think there is ever complacency when you play for your country," Moyes told BBC Scotland. "I think you must never underestimate the opposition. It was always going to be a tough game for Scotland." Moyes says there is still a chance Scotland can qualify for next year's European Championship in France under manager Gordon Strachan. "I think the expectations had got where we felt we just turn up and win the game, but it was far from it," said the Real Sociedad manager. "Gordon has done such a good job that everybody really went there (Georgia) with the belief that it would happen. "But we are still there with a big chance, obviously Germany. Many times what we have done here in Scotland is do it the hard way so let's hope we can beat the World Champions and that would probably make us the best in the world again." Wales, England and Northern Ireland all likely to be at the Euros and Moyes says it would be great if Scotland were to join them next summer. He said: "The home nations are beginning to get a bit of a revival. I'm looking forward to the European Championship because it looks like there are a few countries that haven't been in it before. "I think it means there is up and coming players coming through from other nations. Scotland have been there before but it is a long time since qualifying. Gordon though is doing a great job and we should all be grateful and the team have done very well and let's hope we make it." He says beating Germany will be difficult but not impossible. "It's possible to win any game. Sometimes we do it the hard way and let's hope we can. But you have to remember the quality of the players that Germany have got. "It will be a big test but I'm sure Hampden will be rocking and everybody will be behind the team."